The customer is the boss was once said by a renowned entrepreneur. Customers create demand for products and services and companies following their feedback to generate supply. Business purchases are dependent on its sales. Lower the sales less will be the purchases and vice versa. Revenue is what on the base of which business people make decisions. Managing your sales not only managing but also having a record of them is essential for a business. Merely writing down won’t help as it maximizes the risks of errors. 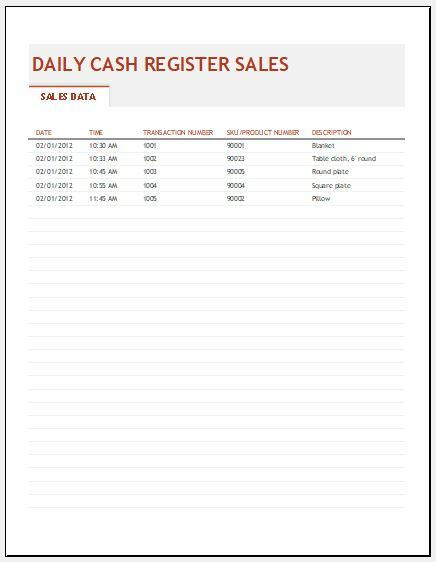 The daily sales report template has been designed by professionals to help business owner know about its cash flows thus controlling them. Recognizing the cost of production and verily identifying sales in its light thus planning future sales. The main objective of this template is to provide the store owner with details of his daily sales. It lets him recognize those products which generate more sales and the ones which are not doing so well. He is then able to manage his cash flows thus adapting to better prospects for future sales. Revenue generating products are known: By tacking record of daily sales the store owner is now in a better position for knowing his revenue-generating products. Thus, he invests more in these highly demanded products. Cut down costs: The store owner by monitoring the daily sales cut down costs. It can do so by purchasing the low revenue products less or even diminishing them from its product line. Future sale prospects: Sales generate revenue for any firm. The daily sales report lets the store owner know of the key factors responsible for its high sales. Once they are known the owner can readily cut its extra cost and invest it in profitable products. Develop customer relationship: The sales report helps in developing a better customer relationship. The store owner can track his customer information through this.